Auto insurance is a legal agreement between you and the insurance company that in exchange for the premiums you pay the insurance company will pay for your covered losses (property, liability and medical expenses). The exact terms of the agreement, including types of losses covered and the amount of the coverage for each type of loss, is spelled out in your policy documents. Most states require vehicle owners to have at least some form of auto insurance. If you own a car, you need auto insurance to protect yourself and others involved in an accident that is your fault or that is caused by an uninsured or underinsured driver. The costs of a single accident could bankrupt you if you had to try to pay them out of your own pocket. Even relatively minor losses could be financially challenging, and some losses could leave you without transportation if you could not afford to replace or repair the car. Having car insurance helps you protect your assets and use your money to achieve other important financial goals. Nearly every state (49) requires that vehicle owners carry some amount of insurance. Not maintaining at least the minimum required amount of insurance is against the law and could result in various penalties. If you are making lease or loan payments on your vehicle, the lender will require you to carry insurance so that if the car were to become damaged or totaled, the lender wouldn’t lose the collateral for the loan. Not maintaining coverage on a leased or financed vehicle could result in repossession. Who is required to have auto insurance? Forty-eight states and the District of Columbia require drivers to carry at least minimal auto liability insurance (coverage that pays for the other party’s injuries and damage in an accident that is your fault). New Hampshire requires that drivers either prove their ability to pay for a certain amount of damage or buy car insurance if they don't want to risk losing their license and registration. Florida requires drivers to carry Property Damage Liability of $10,000 and Personal Injury Protection (PIP) of $10,000, but no bodily injury liability. Since the states set their own minimums, the required amounts vary across the country. If you are leasing or financing your vehicle, the dealer and/or lender will most likely have additional insurance requirements to protect their property (your car). Learn more about state-specific auto insurance requirements from your state’s insurance department and legal advice website Nolo.com. There may also be add-ons to your main insurance policy, such as being entitled to a free rental car while your car is being repaired or replaced, or emergency roadside assistance that provides help if, for example, you have a flat tire, dead battery or run out of gas. What is the difference between collision and comprehensive? Comprehensive insurance fixes your car if something happens to it that isn't the result of an accident, such as a broken windshield caused by a pebble or a dented roof caused by a fallen tree branch. It also reimburses you the value of the vehicle if it is stolen. What is the difference between personal injury protection (PIP) and medical payments coverage? These coverages both pay for your and your passengers’ medical expenses regardless of who was at fault. But PIP typically provides additional coverage that pays for things like lost wages, funeral expenses and other losses. PIP generally also offers higher coverage limits than medical payments coverage does, but can have a deductible associated with it. Neither type of coverage pays for vehicle damage—that would be covered by the party that caused the accident or by your own collision coverage. PIP is not available in all states; in some states it is required. Some experts advise forgoing medical payments coverage if you have good health insurance that would cover your medical bills. If PIP is required in your state, you must purchase it. If it’s optional, and you have good health insurance, you would have to decide if the other potential benefits of the coverage (funeral expenses, lost wages, etc.) are worth the cost. Who is required to have no-fault (PIP) coverage? There are a dozen or so no-fault states, where PIP is required coverage. Contact your state DMV or Department of Insurance to find out if your state is one of them. In the other states, PIP coverage, if available, is optional. Learn more about PIP in general, and about state-specific laws. Some insurance companies sell “accident forgiveness,” an add-on to your policy that keeps your rates from going up after your first at-fault accident. There might be a limit on the claim amount that would be forgiven. In other words, if the accident you caused were major, with a large payout from the insurance company, it might not be overlooked when the next premium period rolled around. Before agreeing to the coverage, read the fine print—it may not be worth the extra cost. When you purchase your policy, you must choose the amount of your deductible (it can be different for each of the coverage types). The higher the deductible, the lower your premiums will be. It is generally better to choose a higher deductible that you pay only if and when the need arises than to continuously pay higher premiums and perhaps never have a claim. You would also want to avoid a history of multiple small claims, even if your deductible were low, as this would increase your rates. Still, you should make sure the deductible you choose is low enough that you could come up with that out-of-pocket amount if you needed to. Set aside your deductible in an emergency savings account. This is a relatively new program, offered by a few insurance companies, under which the insured is eligible to have his or her deductible reduced as a “reward” for accident-free driving. These programs will cost you, though. And according to Consumer Reports, you’ll probably end up spending more than you would save because of the higher premiums. Learn more at CarInsurance.com. Gap protection is not really insurance, it’s a debt cancellation agreement that covers the difference (gap) between your outstanding auto loan and the amount the insurer pays you (the current market value of the car regardless of how much you owe on it) if your car is totaled. The gap refers to the negative equity that occurs when you finance all or most of a vehicle (i.e., put little or no money down) and/or it depreciates faster than you pay down the loan. For example, if your new car depreciates 10 percent as soon as you drive it off the lot, and then you total it a week later, your regular insurance would reimburse you only the 90 percent remaining value—not the full outstanding loan amount. Gap coverage fills (pays) that uncovered gap. You don’t need to consider gap protection if you haven’t financed your car or if, during your loan term or lease, you will not at any point owe more than the car is worth. If you do want gap protection, you typically can buy it through the lender that finances your auto purchase, from an online vendor, from the dealer or from your insurance company. An insurance company often will charge less than the dealer or even other sources, but you’ll have to remember to cancel the coverage when you no longer need it. Shop around, not just for price but for coverage, too. Some protection plans reimburse your insurance deductible, and some offer a vehicle replacement option, which pays extra to replace the car. Learn more about gap protection here and here. Do I have to buy all the different types of coverage available? The only coverage you must purchase is liability. However, if you are financing your vehicle (either through a loan or lease agreement), your lender will require you to have collision and comprehensive coverage as well so that it doesn’t lose its collateral for the debt if the car is damaged or stolen. If you own your car outright (are not making payments), you do not have to buy collision or comprehensive, though you probably should to protect your investment if you have a late-model car in good condition. Many owners of older cars drop one or both of these coverages to save money if they don’t feel their cars are worth repairing or replacing. Your state may have requirements related to other types of coverage, such as personal injury protection, medical payments or uninsured motorist. Learn more about state-specific coverage requirements. My policy “declarations” page says 50/100/25 next to my liability coverage—what does this mean? The declarations page—the part of your policy that provides key details about your coverage—includes your limits (maximum amounts paid if you file a claim). The amount of your liability coverage—the part of your insurance that kicks in if you injure someone or damage their property in an accident you cause—is expressed as three numbers. The first indicates the maximum amount, in thousands of dollars, that the insurance company will pay for injuries to one person in an accident. The second number indicates the maximum amount it will pay for all injuries to more than one person in an accident (whether there are two injured people or five). The last number indicates the maximum payout for repair or replacement of others' property. What are the minimum liability coverage requirements? The minimum liability coverage amounts vary from state to state. For example, in California it’s 15/30/5 ($15,000 maximum payment for injury to one person in an accident, $30,000 maximum payment for all injuries (to multiple people) in an accident, and $5,000 maximum payment for damage to others’ property in an accident), while in Alaska it’s 50/100/25. Click here and here to find out your state's minimums. If you lease your vehicle, the lessor will most likely require coverage greater than the state minimum (stated in the lease contract). And many drivers choose to purchase more than their state’s minimum coverage to protect themselves to a greater degree. Do I need more than the minimum amount of insurance my state requires? Why? Many states have very low requirements—as low as 10/20/10 (Florida)—but this is rarely enough to protect yourself and your assets. Even a moderately serious accident can result in more than $100,000 in claims, and a multi-vehicle crash with serious injuries can cost many times that. Without adequate insurance, you could exhaust its limits very quickly. If your insurance is not enough to cover the damages, the injured can come after your personal assets. If your assets aren’t enough to satisfy the debt, your future wages could be garnished. On the positive side, the cost for additional coverage on an existing policy typically is not very expensive. How do I determine how much insurance coverage I need? Experts recommend basing your liability insurance coverage on your assets. If you have significant assets—a home, savings, etc.—you will want to buy coverage over the state’s minimum requirement. How much over depends on a variety of factors, including how risk averse you are, how likely you are to get into an accident (Do you routinely drive treacherous roads at night or have a history of accidents? ), the amount of your assets, etc. Only drivers who have a low net worth or income and who can’t afford the cost of more protection should consider trying to get by with the minimum amount of liability insurance. In such a case, you would still be liable for the damages and injuries from an accident that is your fault, but there might be nothing for the other party to take from you. Consult your insurance broker or agent for guidance. Do I need personal injury protection (PIP) or “medical payments” if I have health insurance? Drivers who have sufficient health insurance to cover any medical bills resulting from an accident would need to determine if PIP or medical payments coverage is worth purchasing (assuming PIP is optional in your state). One thing to be aware of: Health insurance might cover your medical bills, but it would not provide the additional coverage that PIP offers for things such as lost wages and funeral expenses. Nor would it cover the medical expenses of passengers in your car. How do I decide if I need collision or comprehensive coverage? Collision and comprehensive coverages pay to repair or replace your car (up to a certain amount—the “limit”). The insurer will not pay you more than your car is worth regardless of the amount of damage. (Settlement amount typically falls within the high and low “Blue Book” value of the vehicle.) So if your car isn’t worth much, it might not make sense to keep paying premiums for collision and comprehensive when you could instead be saving that money toward a new car. Having said that, the cost to insure for damage to or theft of your car is not expensive compared to liability insurance. There’s no hard and fast formula for figuring out when to abandon collision and/or comprehensive coverage, but some experts recommend dropping it at the point when you’d be more likely to purchase a new car than repair the old one. Remember, even with collision and comprehensive coverage, you’ll have to pay some of the repair or replacement cost out of your own pocket (your deductible). And the money you get from insurance is rarely enough to purchase a comparable vehicle. Some drivers opt for different deductibles for each coverage type, which can help you save money even if you don’t want to eliminate the coverage entirely. How do I determine the deductible I should have? If you choose to carry comprehensive and collision coverage, you will have to choose a deductible. This can be any amount your insurer offers, but typical deductibles are $250, $500 and $1,000. (They can be higher or lower, too.) The higher your deductible, the lower your premium. Everyone wants a lower premium, but you’ll have to be able to come up with the amount of your deductible should you ever need to repair or replace your car (if nobody else was at fault). So, the first thing to consider when choosing a deductible is how much you could afford to pay out of your own pocket. The second consideration is how much you would save in premiums in exchange for the increased personal financial responsibility for damages or theft. For example, if increasing your deductible from $500 to $1,000 shaves $100 off your annual premium, then you would be ahead of the game if you didn’t have to come up with your deductible for at least five years. How much your premium drops with a higher deductible can vary widely. In some cases, the meager savings are not worth the higher risk. In other cases, you could save a bundle. Learn more about which deductible amounts in which states offer the greatest savings from a study conducted by InsuranceQuotes.com. Some insurers require those who they consider high-risk drivers to have a higher deductible to reduce the likelihood that they will have to pay out for damages. Do I need a business (commercial) auto insurance policy if I use my vehicle for work? Whether or not you need a commercial auto insurance policy depends on many things, including exactly what kind of business you’re conducting and who will be driving the vehicle. When it comes to this type of coverage, it’s best to consult an insurance agent. Be honest and clear about how the car may be used and who might drive it, and ask what kind of coverage you need. To avoid any misunderstandings, it’s a good idea to put your disclosures about how the car will be used in writing and keep a copy, and also keep the written response telling you what your policy will cover. If you only drive your car to and from work, you should be covered under your personal auto policy. But if you take carpoolers regularly, you should ask your agent if you’re covered or need additional insurance. Do I need special insurance coverage if I get paid to give rides in my vehicle (for example, through a service such as Lyft, Uber or Sidecar)? You might. Generally speaking, standard auto insurance doesn’t cover ride-sharing or “livery” services—essentially, taxis. Because regularly giving paying passengers rides in your car is outside the scope of a typical personal policy and increases the level of risk significantly, you could find your claim denied or your policy canceled if your insurer finds out how you’re using your car. Because this has become an issue, some services that connect drivers and passengers now provide drivers some coverage under a company-owned policy, but there are limitations. You should find out exactly when you are covered under the service’s policy (Whenever you are available to take a passenger, only if you have been assigned a passenger or only if you have a passenger in the car?) and for how much. You should also tell your insurer how you plan to use the car and find out if that would cause your policy to be canceled or if you need to purchase additional coverage. Learn more about insurance requirements and coverage for drivers providing rideshare services. How do I go about shopping for insurance? When shopping for insurance, plan to get quotes from at least three different insurers because rates can vary widely—even for the same coverage on the same car and driver. There are also services, such as NerdWallet, that don’t sell insurance but let you compare prices. These are not firm quotes, but they give you an idea of the range of prices and which insurance companies might be on the high and low ends of the spectrum. Make sure to keep the coverage limits the same in each quote request so that you can make an "apples-to-apples" comparison. When you use quote sites, you may not get instant insurance quotes—your information might instead be given to insurance companies that will contact you later. The lowest price is not always the best option—be sure to check the company’s financial strength, claims service record and customer satisfaction rankings. Online quote requests require you to submit personal information about yourself, your car and your insurance needs—each form typically takes 10-15 minutes. What information do I need to request a price quote? This can vary, but for the most accurate price quote you’ll typically need to provide your name, contact information, date of birth and driver’s license number, matrícula consular or other accepted ID; the vehicle identification number (VIN) and make and model, as well as the number of miles on the odometer, number of miles driven annually and any safety features the car has; information (including dates of birth) for others who will be driving the vehicle; and your history of traffic violations and accidents for recent years. A general price quote (through an online insurance marketplace, for example) typically can be obtained with less information. Is it better to buy from a broker, agent, direct provider (insurance company that sells without an agent) or insurance website? That depends on your shopping style. If you’re not comfortable on the Internet or would simply prefer to see the person you’re buying from in person, then you should focus your efforts on brokers and agents who have offices near you. Conversely, if you prefer to shop online and avoid the extra time it takes to go to an office, then direct sellers and insurance websites will be most convenient. Before choosing, make sure you understand how to get help if you have a problem, question or claim—it’s important to know that someone will be there when you need them. Also, if you use a broker, understand if there will be a fee, whether it is negotiable, and whether there will be future fees for renewals, policy changes, etc. Generally speaking, you should avoid brokers who charge a fee for anything beyond the initial policy purchase. Broker fees are avoidable if you purchase a policy through an agent or direct seller (insurance company), but some brokers can offset their fee by shopping your application around to many insurers and getting the best rate. Get personal recommendations from friends, coworkers, neighbors and family. Ask them what they like about their agent or broker. Call or visit the agent or broker and make your own judgment about whether s/he is responsive, qualified, helpful and trustworthy. Check the agent or broker out with your state’s department of insurance. You can find out if s/he has a valid license, has a record of complaints or disciplinary actions, etc. This will help you avoid certain types of insurance scams. Find your state’s insurance department online. The best way to reduce the impact of redlining is to comparison shop for insurance. Contact your state’s insurance department to find out if there are any affordable insurance programs. If you do suspect discrimination, file a complaint with your state insurance commissioner. Learn more about redlining here and here. How do I know that the person I’m talking to about insurance is not a scam artist? Some insurance customers discover the first time they file a claim that the policy they thought they purchased doesn’t exist because the agent or broker kept the premium payment that was supposed to be forwarded to the insurer. The best way to avoid becoming a scam victim is to check out the agent or broker before you pay any money. Work only with licensed agents and brokers—ask to see their license and then confirm it is valid with your state’s department of insurance. Check with the Better Business Bureau to see if there are complaints against the agent/broker or the business. It doesn’t hurt to do an online search for the seller’s name to see what kind of results pop up. The New York State Department of Financial Services offers good advice for insurance customers and drivers in every state. How do I check an insurer’s financial strength, claims service record and customer satisfaction rankings? You can check the insurer’s financial stability—its ability to cover the very large number of claims that would likely result from a major disaster—at one of the independent rating agencies. A.M. Best and Standard & Poor’s are two such agencies. You can check complaint statistics (often related to claims servicing) through your state’s insurance department. There are a few places you can find customer satisfaction rankings. J.D. Power and Associates and Consumer Reports are two sources. You might have to pay a fee to access these. What else should I look for in a policy or insurer? Read through the policy before signing to make sure it contains the coverage you want. Avoid a mandatory arbitration clause, which forces you to give up your right to sue in the case of a disagreement between you and the insurer. If such a clause is in the contract, try to cross it out. If the insurer demands it remain, consider taking your business elsewhere. Know if your insurer requires the use of “aftermarket” parts (those that cost less because they don’t come directly from the auto manufacturer). Some aftermarket parts can be of inferior quality, while others are certified to be of equivalent quality and safety as manufacturer parts. If you feel strongly about using only manufacturer parts, you can check the policy for this information. Learn more about replacement parts at the Certified Automotive Parts Association (CAPA) website. How much should I pay for insurance? The exact dollar figure is impossible to say, but your goal should be to spend the least while still getting sufficient coverage and excellent service from a reliable company. Comparing quotes from at least three companies helps you achieve this. Do I need to purchase auto insurance before buying my car? Yes, you need to have insurance in place before you drive the car away. If you are purchasing it from a lot, you will most likely be presented with the option of purchasing coverage through the dealer. This is not a good idea—you do not have the opportunity to shop around, compare prices and choose the best policy or insurer. Coverage purchased through the dealer will typically be more expensive than coverage you could purchase elsewhere. If you already have auto insurance, contact your insurer to let them know you will be adding or replacing a car on the policy. If you don’t already have a policy, begin shopping around for one at least a week or two before shopping for your car. You can give the insurer preliminary details about the car type in advance (if you have a good idea of what you’ll be purchasing) and/or call from the dealer when you make the purchase. What is the “declarations” page of my policy? It is the page (or pages) at the beginning of your policy where key information can be found, including the name and address of the insured(s), the policy number, the policy term (coverage period) and coverage limits. It also contains a description of the vehicles covered under the policy and the premium amount. What happens if I miss the deadline to pay my renewal premium? The ramifications of missing your premium due date can vary. Possible consequences include a late fee, increased premiums due to a negative (late) payment history, a canceled policy and/or difficulty finding another insurer to cover you. If your policy is canceled and you have not purchased a new one, yet you continue to drive, you also risk a fine, license suspension and other penalties for driving without insurance—and financial ruin if you cause an accident. Remember that the due date is the date by which the insurer should have your payment in hand, not the day you drop the payment in the mail. Since there are so many factors that contribute to your insurance cost, there are many ways to reduce your premiums. Here are some key ways to save money. Not all are right for everyone, but you can choose those that would work for you. Bundle your policies. Having all your insurance policies (autos, home, etc.) with one insurance company is one of the easiest ways to save money. Ask about multi-car and multi-policy discounts. However, it’s wise to compare the bundled price from one carrier to the combined premiums for policies purchased from different carriers to make sure bundling really is the best option. Ask about ways to reduce the rates on your at-home teen driver. This could include assigning your teen as an occasional operator of your least expensive car, earning good grades, taking a safe driving course, etc. Drive less. The fewer miles you travel in a year, the lower your premium. Many insurance companies give a price break to policyholders who drive fewer than 7,500 miles per year. Increase your deductibles. Sometimes the savings for increasing your deductibles (collision and comprehensive) are significant and worth the added risk, and sometimes they’re not. Do some calculations to see how many years you’d have to go without damage or a theft to accumulate enough savings to cover the greater out-of-pocket costs. Set aside the amount of your deductible so that it’s there when you need it. Drop your collision and/or comprehensive coverage. This won’t be possible if you’re making payments on your car. But if it’s paid off, and it’s old enough or in bad enough shape that you would probably not repair it if it were damaged or you could afford to pay for a replacement if it were stolen, dropping these coverages might make sense. (It may help to know that collision is typically significantly more expensive than comprehensive.) Make sure the savings make up for the added risk and that you’re prepared to replace your car if necessary. Reduce your liability coverage. This should only be done if your coverage would still be adequate to protect your assets. Advisors overwhelmingly caution against purchasing only the minimum required coverage. Ask about discounts for things you could do such as taking a driver education course, installing a car alarm, or ensuring the car you buy has safety equipment that will earn you discounts. In addition, some car models are cheaper to insure than others—and it's not always the lowest-priced model that qualifies for the lowest premium. Find out from the insurer at what ages rates go down (for example, when young drivers turn 25, or for experienced drivers turning 40 or “mature” drivers turning 50). Then be sure to notify your insurer when you have a birthday that takes you to that magic age. It goes without saying that avoiding accidents and tickets will keep your rates down. An insurance professional can give you the exact dollar amount of your potential savings and may even be able to come up with other cost-cutters. For more guidance in this area, check out "How to Save Money on Auto Insurance" at Edmunds.com. I’m in the military—are there any discounts for servicemembers? Many insurers offer discounts for members of the military, so be sure to ask if there are any breaks available and if you qualify. Also, if you will be deployed and your car will be sitting idle while you are away, ask your insurer if you can suspend any part of your coverage to save money. This option may not be available in all states or from all insurers, but it might pay to ask. Should I participate in a “pay as you drive” insurance program and have my driving tracked to reduce my premiums? “Usage-based” insurance programs require that you allow your driving to be tracked via a small device plugged into your car’s computer system. The insurance company uses the data gathered—when, how and how far you drive—to decide if your driving merits a reduced premium. If you are deemed a safe driver who drives infrequently and at times that are not particularly risky, you may be charged a lower premium. Usage-based insurance programs aren’t offered by every insurer or in every state. If you have the option, ask the company for details—what is tracked, how is the information used or shared, how long must the device remain on the car, whether your premium could go up if the company doesn’t like the data it gathers, etc.—before signing up. I’m moving from my parents’ small-town home to a big city. Should I continue to get my insurance statements there so that I don’t have to pay higher urban rates? As a general rule, drivers who live in cities pay more for insurance than rural drivers because of the higher rates of vandalism, theft and accidents. But misrepresenting where you live so you can pay lower rates than your actual risk level warrants could have serious consequences, including finding yourself without insurance coverage when you need it. Never give an insurance company a reason—lying about where you live, how many miles you drive annually, who drives the vehicle or for what reason (business vs. pleasure)—to deny your claim. I got a ticket—will this make my insurance premiums go up? In many states, you can keep the occasional ticket off your record and avoid an insurance rate increase by completing “traffic school,” an online or in-person driving course. There is a fee for the class (typically less than $100), and you’ll still have to pay the ticket, but this could still cost less than what an insurance increase would cost you over time. Check with your state’s motor vehicles department to find out if you’re eligible for traffic school if you are not notified by the law enforcement agency that issued the ticket. Is “accident forgiveness” coverage worth the extra money? While some insurance companies automatically forgive the first at-fault accident for long-term policyholders with a clean driving record and no claims, these and other insurance companies may offer “accident forgiveness” as a paid add-on that keeps your rates from going up after your first at-fault accident. Whether or not the additional cost of accident forgiveness coverage is worth it or not depends on a variety of factors, including personal risk tolerance, cost and insurer policies. There might be a limit on the claim amount that will be forgiven. If the accident you cause is major, with a large payout from the insurance company, it might not be overlooked when the next premium period rolls around. Ask the insurer about any limits on the accident that will be forgiven. While accident forgiveness will make the accident disappear for the purposes of calculating your premium, it may not protect your “good driver” status (if you had that before the incident) or guarantee that the insurer will renew your policy. Any at-fault accident counts as your first accident. So you might pay for accident forgiveness just to have your one “free” accident be a minor fender bender in a parking lot. Even without accident forgiveness, such a minor accident might not have raised your premiums significantly. How long will my rate increase due to a ticket or accident last? Policies vary from company to company, but three years is typical. I can’t afford auto insurance—can I drive without it? An even greater risk is the possibility that you could cause an accident while uninsured. The claims could cost you many thousands of dollars (even tens or hundreds of thousands, or more). If you don’t have enough money to cover the claims, you could be sued and forced to sell your assets to come up with it or have your wages garnished until the debt is paid off. Rather than drive without insurance, purchase at least the minimum amount your state requires. Shop around to get the lowest premium. Forgo collision and comprehensive if that is the only way to afford liability coverage. If you are driving a newer car, a sports car or some other type of vehicle that is expensive to insure, consider changing it—some cars cost much more to insure than others. Find out from your state’s department of insurance if there is a low-cost auto insurance program for low-income drivers. What is a low-cost auto insurance program, and who offers them? The program, which requires applicants to have a valid California license, is open to immigrants in the country illegally who obtain a California driver’s license under a new law (AB60) that took effect Jan. 1, 2015. The program probably offers the lowest prices for low-income immigrant drivers, who have no official state driving record. Learn more about California’s Low Cost Automobile Insurance Program at the program site, or download the latest brochure from Consumer Action’s website. California law requires that insurance agents inform customers about the Low Cost Program if they request a “minimum” or “basic” auto insurance policy. Not all states offer a similar program, but some do. Contact your state’s insurance department for guidance if you are having trouble finding affordable coverage. What does my credit score have to do with my auto insurance rates? While having good credit doesn’t necessarily mean that a policyholder is a good driver, the research indicates that they generally file fewer or less expensive insurance claims. Because they are considered less “risky,” insurance companies are more likely to insure high-score consumers and may even give them lower rates. This practice is criticized by many consumer advocates as an unfair and discriminatory way to set rates. Some states have legal restrictions on how credit data can be used by insurance companies. A credit score predicts the likelihood that you will repay money you borrow on time based on your payment history and other information in your credit report. A “credit-based insurance score” predicts the likelihood of you filing an insurance claim based on certain information in your credit report. The vast majority of auto insurers use an insurance score when evaluating an insurance applicant. In states where it’s allowed, nearly all insurance companies use insurance scores along with other information to help them assess your risk level and determine the rates you’ll pay. But no state allows credit-based insurance scores to be the sole basis for underwriting or pricing decisions. A few states (California, Hawaii and Massachusetts) have effectively banned insurers from using credit as a factor in auto insurance decisions. Can I see my insurance score? After receiving an insurance quote, you can ask the agent if a credit-based insurance score was used in the underwriting process and, if so, what risk category you were placed in. The insurer doesn’t have to disclose your score but it might, or it will give you an idea of where you landed. You can also purchase your LexisNexis auto insurance score for $12.95. Keep in mind that the insurer you apply for coverage with might not use this particular score. You can improve your insurance score by improving your credit. Make sure bills are paid on time, keep your credit utilization as low as possible (amount of total credit used out of total credit available), open new accounts only if you need them, and don’t close unused accounts with high credit limits (this can hurt your utilization ratio). It also may help to correct any errors in your credit report. You can order one free copy of your credit reports from each of the three major credit reporting agencies every 12 months at www.AnnualCreditReport.com. You probably know that your credit history is gathered and compiled into credit reports to be used by lenders and others to decide whether to do business with you—lend you money, rent you a home, hire you or sell you insurance. There are other reports that compile very specialized types of information about you. These “specialty” reports include insurance reports, which tell insurance companies about claims you have made against your homeowners or automobile polices and help them make underwriting and pricing decisions. Insurance reports compile information about you that is provided by insurance companies who subscribe to, or are members of, the reporting service. Other insurance companies who are also members can access your report. Comprehensive Loss Underwriting Exchange, or C.L.U.E. A third report—Insurance Information Exchange—includes not only insurance claims activity, but motor vehicle records and things like criminal, employment and education history as well. What information does my insurance claims history report contain? Learn more about these and other specialty reports in the “Specialty Consumer Reports Issue” of Consumer Action News. What is the difference between an inquiry and a claim? Is there a way to keep inquiries out of my report? A claim is your official report to the insurance company that you have suffered a loss and are requesting payment to cover it. An inquiry is your request for information about your coverage. While inquiries are not supposed to be included in the report, they can end up there if the inquiry is about an actual loss that could, potentially, become a claim—even if a claim was never submitted or paid. To avoid the “ding” of an inquiry, speak to your insurer only in general terms unless you plan on filing a claim. You might even tell the agent or representative directly that you are only making an inquiry, or otherwise make clear that the loss you are asking about is purely hypothetical. Once you disclose that a loss has occurred, there is a good chance it will land on your report. To find out if this practice (including inquiries in your report) is prohibited in your state, contact your state’s insurance department. Can I prevent an insurer from accessing my reports? When you apply for insurance, you give permission to the insurance company to obtain any reports it needs. Refusing to grant this permission certainly will get your application denied. Can I obtain my report? Why should I request a copy? Click here to order your C.L.U.E. report, or call 866-312-8076. Click here to order your A-PLUS report, or call 800-627-3487. Click here to order your Insurance Information Exchange report, or call 800-683-8553. You might want to order your reports before you apply for insurance to be aware of what the insurance company will see and to make sure there are no mistakes. Errors could include someone else’s claims included on your report, either through error (due to a similar name, birth date or Social Security number) or identity theft; claims amounts that don’t match the actual payout or that were not paid; and claims that are more than five years old. You will also want to order your report(s) if you are a victim of identity theft and/or insurance fraud. There’s a mistake in my report—how can I fix it? Under the FCRA, you have the right to dispute inaccurate information or request that outdated information be removed. If you file a dispute (following the directions that come with your report), the reporting agency must investigate within 30 days, remove any information found to be incorrect or outdated, and send you a free copy of the new report if changes have been made. Cleaning up your report could help you qualify for better insurance rates. You also have the right to have a 100-word personal statement added to your report to explain any derogatory (negative) information. Anyone who requests your report would see it. Your motor vehicle record (MVR), or driving record, is a history of your traffic violations, accidents and driver’s license information. Insurance companies use the record in their underwriting process, to determine whether to insure you and, if so, to set your premiums. You can obtain your record from the Department of Motor Vehicles for a nominal fee. Your insurance agent might also be willing to provide you with a copy. Getting your record before you apply for insurance allows you to see what the insurance company will see (according to Insurance.com, not every traffic ticket appears on your MVR) and gives you an opportunity to correct any mistakes. What is an insurance “claim”? An insurance claim is your documented request for payment for a loss you believe to be covered by your insurance policy. When and how should I file a claim? Whether or not you file a claim depends on many factors, including the extent of the property damage and the amount of your deductible, and whether or not there were injuries. For example, if you sideswiped a pole but you didn’t get injured, and the damage to your car was $1,200, and your deductible is $1,000, you would have to decide if it would be worth having a claim on your record just to receive $200 from your insurer. If you determine that filing a claim makes sense, be prepared to provide your own identification, policy number and details of the loss as well as contact, license and insurance information for anyone else involved. Learn more about filing a claim for an accident that wasn’t your fault. Your case will be assigned to a claims specialist who will gather information, make inspections in some cases, decide on payment based on coverage and settle the case. Stop if it is safe. Call the highway patrol, police or other law enforcement agency if the accident is serious, is blocking traffic, etc. Take photos of vehicles and any apparent injuries if the other driver is clearly at fault. Never admit fault at the scene of the accident. Get the other driver’s name, address and phone number, driver’s license number and insurance information (company name and policy number). Notify your insurance company. Fill out any required paperwork. Ask if you must report the incident to your state DMV (reporting requirements vary by state). Contact the DMV to confirm what your insurer tells you and/or make the report. If you have any injuries at all, visit a doctor as soon as possible (if you are not taken by ambulance). Delaying medical attention could make it difficult for you to prove the injuries were a result of the accident. Take and keep notes from the moment of the accident through settlement, including communications with insurance companies and others involved in the incident, health-related repercussions (missed work days, for example), etc. Should I file a claim even if the accident wasn’t my fault? Yes. This could protect you if the other party doesn’t have insurance, has inadequate insurance, believes that the accident was not his or her fault or is insured by a company that is not forthcoming with a settlement. You should notify your own insurance company; it may advise you to file a claim with the other driver’s insurance company or it might take care of that on your behalf. In a no-fault state (where you must have personal injury protection coverage), you must file the claim with your own insurer. Will I be covered if someone else was driving my car and caused an accident? If the driver of your car was at fault and you carried adequate insurance at the time of the accident, you should be covered (see the exception in next paragraph). Generally, your insurance would provide primary coverage (pays first) and the driver’s insurance, if s/he has auto insurance, might kick in if the losses exceed your coverage limits. If the driver using your car isn’t insured and the limits on your policy aren’t adequate to cover all claims, you could be sued for the difference. Ultimately, if you let someone else drive your car, assume that the liability will be yours. If the driver of your car is an “excluded” driver—someone who is specifically not covered under your policy—you would not be covered if s/he caused an accident in your vehicle after you gave permission to drive it. An insurer may ask you to exclude someone it considers a high risk (based on a bad driving record, for example), or you may choose to exclude someone (your teenager, for example) to avoid paying a higher premium. Not all states allow driver exclusions. Learn more from Esurance. To be safe, confirm coverage with your insurer before lending your car to anyone. Do I need to file a police report for vandalism to or theft of or from my vehicle? Yes, most policies require that you report this type of loss to authorities. Even if you don’t receive the report right away, the officer should be able to provide you with a case number, which your insurance company may request. Who pays my deductible if the damage to my vehicle is not my fault? If the claim is filed with your own insurance company (rather than the other driver’s insurer), you would have to cover your deductible upfront. However, your insurance company may attempt to recover your deductible from the at-fault party or his/her insurer and would reimburse you if it succeeds. When shouldn’t I file a claim? Some insurance companies require that any accident be reported, no matter how small. This could protect you if injuries or additional damages are discovered later. The fact is, some drivers choose not to report a very small incident if the damage or lost property is valued at less than their deductible. Learn about the pros and cons of reporting a minor accident in Nolo’s article “Do I Need to Report a Minor Car Accident?”. If and how much your rates will go up after an “unforgiven” accident depends on the type and cost of the accident, whose fault it was and the insurer’s “surcharge” schedule. Surcharge amounts—the size of the rate increase after an accident—vary widely from insurer to insurer. Learn more about accident surcharges in the Insure.com article “How much will my insurance go up after an accident?”. The rate impact of any claim depends in part on whether the insurer decides you were at fault. While in some states a driver is determined to be either fully at fault or not at fault, other states employ a more complex formula that divides up the fault, making it possible for each party involved to be assigned some blame and, potentially, have their premium affected. Generally speaking, an insurer can’t raise your rates or cancel your policy for making a claim that’s not your fault. Be aware that a simple inquiry about if and how much your rates would go up as the result of a specific accident—even so minor that you will not file a claim because the damage doesn’t exceed your deductible—could end up on your insurance loss history reports and increase your auto insurance premiums now or in the future. Multiple claims within a short period or claims resulting from reckless behavior (including driving while under the influence or multiple speeding tickets or other moving violations) could cause your policy to be canceled. Claims fraud refers to the attempt to receive payment from an insurance company either in excess of the actual loss (inflated claim), for a loss that is not covered (either because it is excluded or because the loss happened before the insurance was in place) or for a loss that is manufactured (false claim). Insurance claims fraud is a crime. Even if you are not charged and convicted, your insurer could deny your claim, raise your rates or cancel your policy entirely. If you receive payment and then are found to have been lying, you could be ordered to repay the settlement money. Learn more about claims fraud at CarsDirect.com. What if my claim is denied or I’m not satisfied with the way the insurance company handled my claim? You can negotiate on your own behalf if you have the time to do the required research, stay on top of communications and file complaints with the appropriate entities. You can pursue arbitration, mediation or appraisal, all of which entail a neutral third party making a judgment about the facts of the dispute and/or the value of the property. You can hire an attorney or a “public claims adjuster,” professionals who will interpret the “fine print” of your policy, defend your rights and fight to get you the highest settlement possible. You can contact your state’s department of insurance to file a complaint and/or find out more about your options. Learn more about resolving claim disputes on the United Policyholders website. If your claim is strictly for damage to or loss of property (not injuries), you might consider hiring an attorney only if the initial reimbursement amount is too low to cover your losses (i.e., pay for repairs or replacement) and you are unsuccessful negotiating a satisfactory settlement on your own. The losses in a case where there are injuries can be very high, which means that the difference between what the insurance company offers to pay and what you feel is necessary to fully cover your losses can be significant—significant enough to warrant the expense of an attorney. If you have trouble getting your medical bills paid by the insurance company (yours or the other driver’s) or you feel that the settlement offered is too low and you can’t reach a satisfactory resolution, you might want to consult with an attorney that specializes in insurance claims. These attorneys are experienced in trying to get the greatest settlement amounts for their clients, including payment for pain and suffering and other intangible losses. Even if you don’t have the money to pay an attorney upfront, you can still hire one that agrees to a contingency fee agreement—payment of a portion of the settlement (typically 33 percent to 40 percent) when the case is closed. Learn more about hiring a lawyer to help resolve your claim at the United Policyholders website. I have been turned down for auto insurance because of my bad driving record—what can I do? The insurance industry ranks drivers as preferred risk, standard risk and high risk. There’s no national or industry standard for what constitutes high risk, but drivers typically fall into that category if they have been convicted of driving under the influence, have multiple tickets for speeding and/or reckless driving or have had multiple accident claims. Limited driving experience and a poor credit history can also contribute to your risk level. Insurance will be more expensive for you, but you should still be able to get coverage. There are insurance companies that specialize in high-risk drivers, mainstream insurance companies that offer policies for high-risk drivers, and others that won’t insure high-risk drivers at all. To find an insurance company that will cover you, do an online search for “high risk auto insurance” or use an insurance referral website. (See the "Shopping for insurance" section above for some examples.) As with any type of insurance, get more than one quote, understand the coverage you’re getting and check out the insurer’s ratings. You may be able to improve your risk level by taking a defensive driving course and getting a less “sporty” car. Avoiding tickets and claims for at least three years definitely will improve your status. What if I still can’t get insurance? What is “assigned risk”? All or most states have “assigned risk” systems, under which high-risk drivers must be allowed to purchase liability insurance even if they normally would not be eligible for coverage under insurers’ standard underwriting guidelines. Criteria vary, but generally speaking, if you’ve been turned down for coverage three times, you’ll probably be accepted into the assigned risk pool in your state. “Risk pool” programs are intended to be a last resort for those who companies aren’t willing to insure voluntarily. The programs typically are administered by the state’s Department of Insurance or the DMV. Applicants are assigned to insurance companies in proportion to the amount of auto insurance each company sells in the state. Although the companies are required to insure the assignees, they may charge higher premiums or impose certain conditions. SR-22 (FR-44 in some states) doesn’t refer to insurance. An SR-22 is a certificate of insurance required by most state DMVs for certain drivers who must present proof they have liability insurance. Regulations vary from state to state, but this could be because you were cited for DUI or because you were caught driving without insurance or caused an accident and had inadequate coverage. Your insurance company will fill out the SR-22 form for you, which you will submit to the DMV. There may be a filing fee. I want to purchase auto insurance but I can’t afford it—what can I do? While it might not be sufficient for your needs, you could purchase only your state’s minimum required amount of liability insurance until you can afford to increase the coverage. Cut costs elsewhere in your budget, if possible, to free up money for insurance premiums. I am unhappy with my insurer’s claims decision/customer service/rates—what can I do? If you believe an auto insurance company has treated you unfairly (acted in “bad faith”), you can contact your state’s department of insurance to file a complaint and/or find out more about your options. You might also consider consulting an attorney specializing in insurance to find out if you have a case—many states have laws that require insurers to treat consumers fairly. You might have success resolving the issue yourself by communicating with the insurance company directly. Read United Policyholders’ “Speak UP: How to communicate with your insurance company” and Consumer Action’s “How to Complain” for guidance and tips to help you get results. I can’t find affordable auto insurance—whom do I complain to? Not all states have programs to help low-income drivers afford insurance. If you can’t find affordable coverage, you should notify your state’s department of insurance and your state legislators so that they are aware of the problem and can pass laws that help. I am aware of someone committing insurance fraud—who do I notify? You can report insurance fraud to your own insurer, your state’s department of insurance and the National Insurance Crime Bureau (NICB), online or at 800-TEL-NICB (800-835-6422). Where can I learn more about auto insurance? Visit your state’s DMV website for information specific to your state, such as the minimum liability coverage required, where to find safe driver courses and more. Do an online search for your state’s name plus “DMV.” You can also check the state government section of your telephone directory. Your state’s insurance regulator often has helpful information in print and online. Visit the National Association of Insurance Commissioners (NAIC) website to find your state’s regulator. 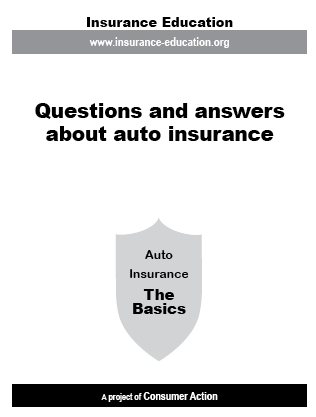 The industry-supported Insurance Information Institute offers free information to improve the public’s understanding of insurance—including a large section on auto insurance. Major insurance companies and online insurance vendors typically have a large library of consumer education articles. One benefit of reading an insurance company’s consumer or policyholder information is that you may get an idea of that company’s policies regarding coverage and claims. Do an online search for your own or other insurance company names, or visit the websites mentioned in the “Shopping for auto insurance” section above. Read your policy. This document is full of specifics about what is covered and what is not. Call your insurer or broker to ask general questions if you don’t understand the coverage details.